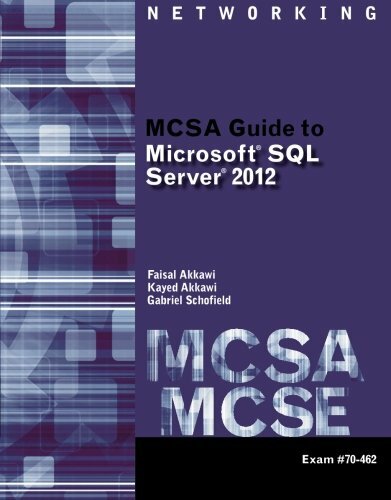 MCSA GUIDE TO MICROSOFT SQL SERVER 2012 (Exam #70-462) provides a thorough introduction to essential database administration principles and practices to prepare readers for certification and career success. Ideal for formal courses, self-study, or professional reference, this detailed text employs a lab-based approach to help users develop the core knowledge and practical skills they need to master Microsoft SQL Server administration in an enterprise environment and pass Microsoft Certified Solutions Associate Exam 70-462. The text opens with information on the latest version of Microsoft SQL Server, offering step-by-step guidance on selecting an edition and completing initial installation and configuration. Several chapters then explore key topics such as database programming, security, performance tuning, backup and recovery, data integration, and system monitoring. Within each chapter, numerous resources and features reinforce teaching and learning, including learning objectives, summaries of key ideas, hands-on activities, discusssion questions, definitions of important terms, and case studies to provide real-world context. If you have any questions about this product by Course Technology, contact us by completing and submitting the form below. If you are looking for a specif part number, please include it with your message.